Alter the playback speed and pitch rate of audio files. Is there a better alternative to AudioLobe? Is AudioLobe really the best app in Audio category? Will AudioLobe work good on macOS 10.13.4? AudioLobe allows you to independently alter the playback speed and pitch rate of audio files. If you are a musician or interested in audio this means you can slow down complex sequences of audio without the vocal or instruments sounding unintelligible. Great for learning difficult notes in a musical sequence. For example, you could set a section of the audio to loop at whatever playback speed you want and easily follow what is happening, without having pitch changes. 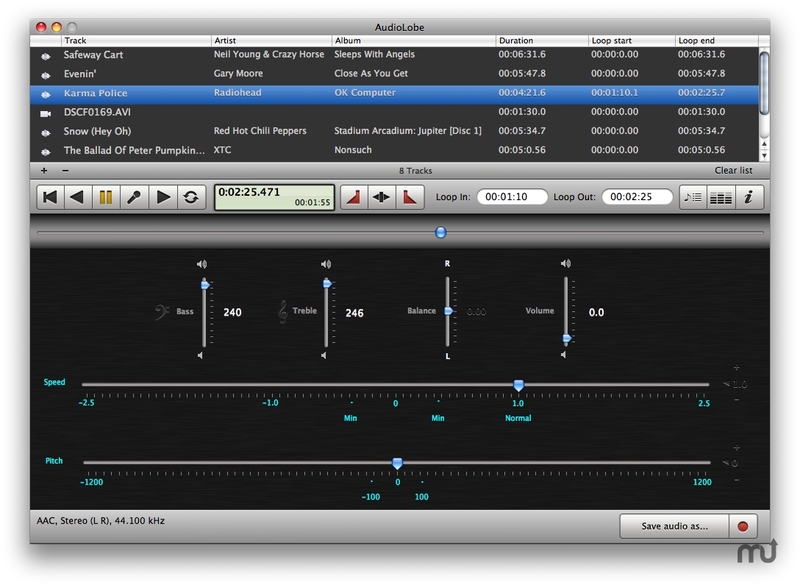 AudioLobe 3 allows files to be saved with altered play speeds, and a major update to the interface. Corrected the alignment of the timecode display in the audio recording panel.